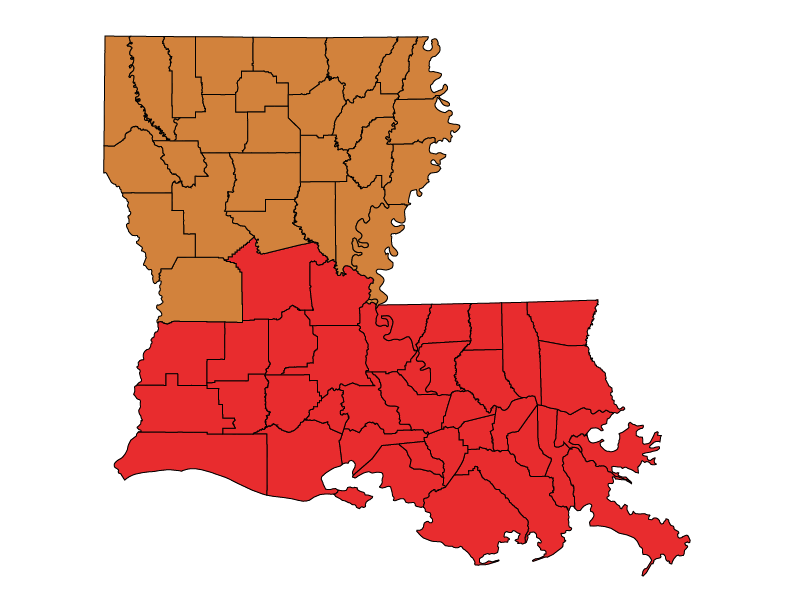 In Louisiana, commercial buildings are defined as all buildings designed for human occupancy, except one and two family dwellings. The code applies to new commercial buildings and buildings that undergo major renovation. For more information on what projects are required to comply with this code, click here. Plans and specifications for all construction under the purview of the Office of the State Fire Marshal (OSFM) or the State Office of Facility Planning and Control must comply with the revised CBECC. Regulatory: Building codes for one- and two-family residential buildings are promulgated through the Louisiana State Uniform Code Council. Because the state adopts the International Residential Code (IRC), changes to the IRC are reviewed and recommended by an IRC review subcommittee, then a Technical Advisory Committee, then by the full Code Council. The final decisions of the Code Council are must then proceed through the state’s administrative rules review process before becoming law. Building codes for other residential buildings and all commercial buildings are developed by the State Fire Marshal’s office. The LSUCC for low-rise residential buildings was last updated January 1, 2015. The CBECC for all other buildings was last updated July 20, 2011. As of March 2017, there is a draft rule to adopt the 2015 IBC, including the 2015 IECC for commercial buildings. The effective Louisiana residential energy code becomes the 2009 IRC Chapter 11. ASHRAE Standard 90.1-2007 now applies to all private commercial buildings built or remodeled as well as all state-owned construction. Multi-family residential construction must comply with the 2009 IECC. COMcheck may be used to show compliance. The Louisiana State Uniform Code Council votes to revise the LSUCC by substituting the energy efficiency section (Chapter 11) of the 2006 International Residential Code (IRC) in place of Chapter 11 of the 2009 IRC for one- and two-family residential buildings. The proposed rule was published in the May 2010 Louisiana Register (see pages 1135-6) and became effective January 1, 2011. REScheck can be used to show compliance. Louisiana adopts its Commercial Building Energy Conservation Code (CBECC), based on ASHRAE 90.1-2001 and the 2000 IECC. ASHRAE 90.1-2001 applies to commercial buildings and multi-family residential structures over three stories. The CBECC applicable code for multi-family structures three stories or less was the 2000 IECC. This code update, enacted by House Bill 552, goes into effect on June 21, 2005. Senate Bill No. 1167 is passed and enacted. This act created a new Part IV-B of Chapter 8 of Title 40 of the Louisiana Revised Statutes. The purpose of the legislation is to institute minimum energy conservation standards for all new commercial construction and all applicable alterations and repairs in commercial buildings. The legislation was passed in June 1997, signed by the governor on July 14, 1997, and became effective on January 1, 1999. The legislation also establishes requirements for education and training and an Advisory Committee.